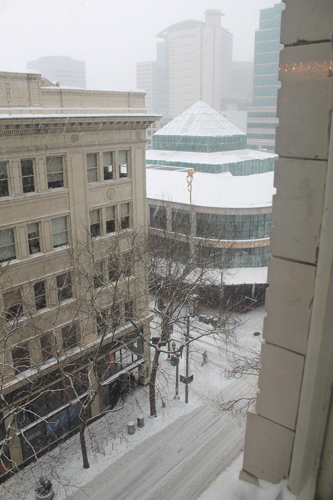 Snowy, snowy Portland! They weren’t really prepared for so much snow – 5-10 inches! – so things got a little messy and slushy, but that didn’t affect those of us at SewDown Portland! Being snowed-in is a great reason to stay inside and SEW! 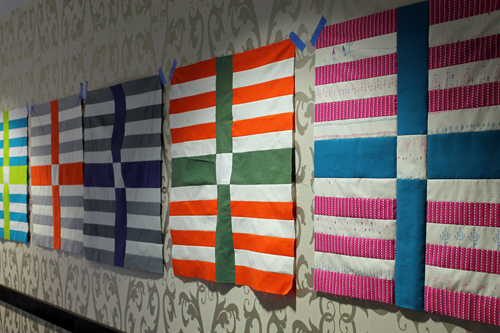 February 6-9 was SewDown Portland, a Modern Quilt Guild event sponsored by BERNINA of America. 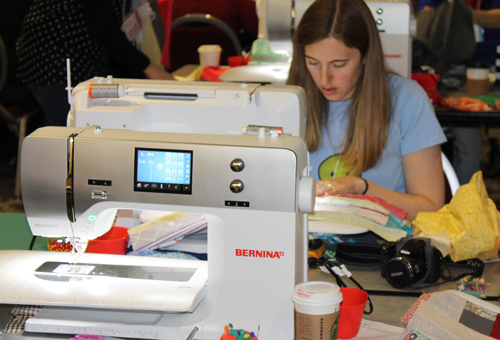 Three days of sewing workshops and lectures – plus scrumptious food and a swanky hotel – four rooms of BERNINA 350 PE and 750QE sewing machines, and dozens of quilters ready to sew and have fun! I landed at Portland Int’l Airport Friday afternoon, hopped in a cab, and headed for The Nines Hotel. 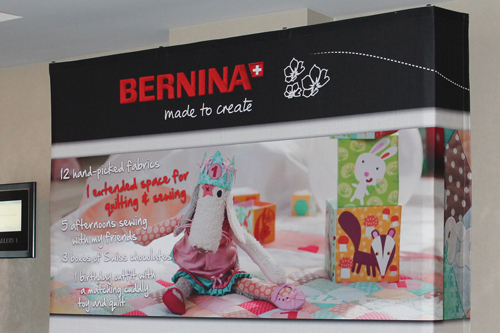 The rest of the BERNINA crew were waiting in the lobby and whisked me away for a quick trip to Modern Domestic to see the store and meet everyone. Gorgeous place! Great selection of indie patterns, beautiful fabric, colorful trims, and absolutely super staff. Then we took a little break for gourmet ice-cream before heading out again. Yes, even with several inches of snow on the ground, we stopped for fabulous flavors at Salt & Straw. Yum! Then back to the hotel to set up machines. They were a little late arriving, but everyone pitched in and we had eighty machines unpacked, threaded, and ready to sew in about (90 minutes?) Woo-hoo! Great job, team! People had been arriving for SewDown – a.k.a. 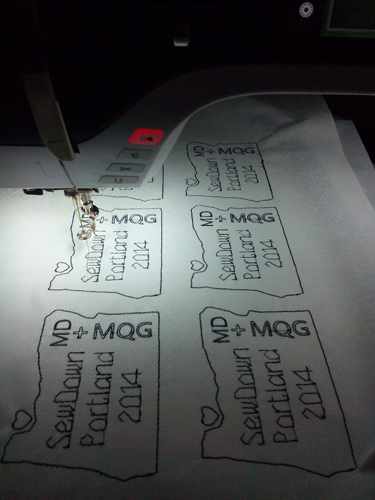 “SnowDown” – all afternoon, and many were all set and ready to sew when we opened the machine room doors. Others had their nails done at the SOAK table, with polish color-coordinated to fabrics from some of our favorite fabric designers. In addition, Modern Domestic was there with sewing and embroidery machines, and Drygoods Design had a fabulous pop-up store. I admit to breaking a New Year’s resolution and buying fabric (how could I resist? )… and a set of shocking neon pencils. Several hours later we all said “Good-night” and went off to our luxurious rooms. I’d been up since 4 a.m. eastern time (…yawn…) and was SO ready to sleep by midnight! 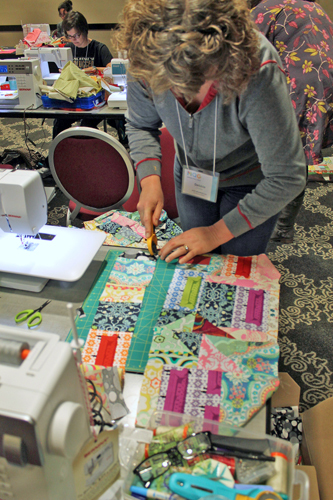 Saturday: Morning and afternoon sewing sessions, lunch and dinner lectures, followed by another late-night open-sew session. Four classrooms, four teachers rotating from room to room throughout the weekend. Plus two lectures: Violet Craft at lunch and Valori Wells at dinner. Sunday: Classes, lunch lecture by Bill Volckening, a last opportunity to shop, and then off through the snow to fly home again. I took the red-eye back to NC and actually slept a bit. As I drove home from the airport last Monday morning, it started to snow. Big fluffy flakes. They must have followed me home. It snowed and snowed and snowed some more. Guess what? I’m snowed in again, just like in Portland! Here’s a peek at SewDown Portland for those who didn’t attend, as well as a reminder of a super sew-in weekend for those who were there. Enjoy!